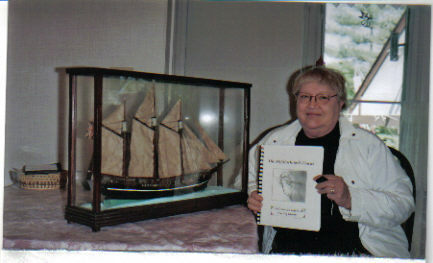 This picture was taken by Capt Gleason who has collected models of ships that were made in the 1800's. This is a Sail Ship called "The Brothers" which Capt John McIntosh built and sailed with passengers to Canada and USA. Captain John McIntosh was born in 1754 in Colarich, parish of Logierait, Scotland and was married to Anne Ferguson. They had five children all boys John James, Charles, William, and David. They came to Canada in 1801. Captain Charles McIntosh was born Aug 1, 1800 and died aboard his ship Cobourg in 1834 when his son Charles II McIntosh was less than a year old aboard the Cobourg at York, ON. 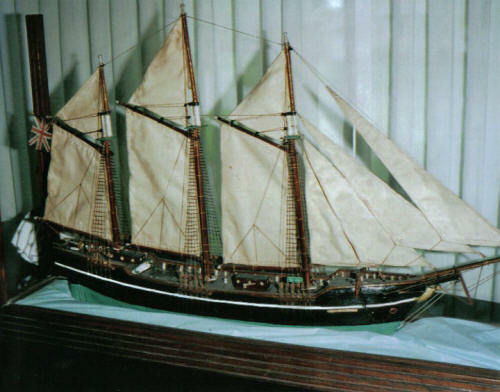 One of the ships passengers and Captain Charles McIntosh stayed aboard to tend to the sick passenger. Captain James McIntosh left the ship to visit his newborn baby, whereby he, his wife, his father, also took malaria and died. My Gr Grndfather Charles McIntosh, born Aug 1, 1833 lived with his sister who was 7 years older along with the wife of Charles born near Caledonia, On who had survived but died shortly after his sister was married and moved to New York, Ny. Charles McIntosh then moved with the McPherson family to Puslinch, Ont and eventually married Janet McPherson. They had the following children Marjorie, Peter, Margaret, Isabella, and Charles III, my grandfather who married Ida Belle Corrigan. They had the following children Harry-my dad, Elgin and Ivan. Donald McIntosh 1890-1955 married Mable Boylan and had the following children Leonard, Willard, Orbie, Lorne, Donald and Lenore. If anyone wants further information you may contact me.